Aftermarket services are a high-margin business, and they account for a large portion of profits, especially in heavy equipment manufacturing. The biggest problem in the present-day world is the high competition and volatility of market fluctuations, causing downturns and upturns. No matter what the causes are, the effect is either going to have high backorders from customers or end with huge unsold inventory lying on the shelf. There is not a one-size-fits-all answer to solve this problem. In recent years, many large heavy equipment OEMs experienced excess inventory levels in a downturn and stock outs in an upturn. To carry the right inventory at the right time, in the right regions, for the right customers has always been a challenge, especially during volatile market situations. Recently, one of CGNs clients had gone through a severe downturn, and as a result launched initiatives, reducing material costs and inventory, across the organization. Even before the recovery was seen, the company experienced a sudden growth in demand, which resulted in back orders. CGN’s extended collaborative supply chain management solution, which encompasses concepts of collaboration planning, forecasting and replenishment (CPFR), as well as CGN's digital strategies have helped clients understand customer behavior, provided correct upstream forecasting signals, established end-to-end supply chain connectivity and reduced back orders, while improving service levels. Collaborative planning, forecasting, and, replenishment (CPFR) extends vendor managed inventory principles and is the latest stage in the evolution of supply chain collaboration. Older supply chain initiatives have gaps in their practices. As in many operations, financial plans take precedence over forecasting, resulting in high inventory levels, lower order fill rates, and increased expedited activities. CPFR is a set of business processes that help eliminate supply and demand uncertainty through improved communication and collaboration between supply chain trading partners. Collaboration is the crux of CGN’s supply chain management. 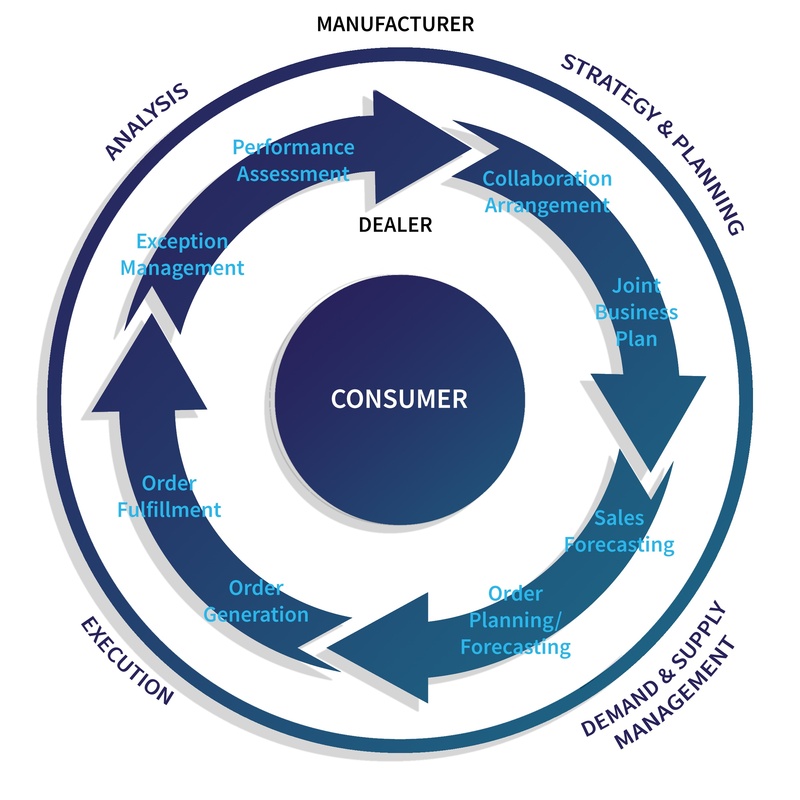 Ongoing and long-term collaboration and partnership between manufacturers and dealers delivers value to customers and profitability to all collaborating partners. Our experience suggests that, for the CPRF model to be successful, it is more important to align supply chain goals with digital strategies. CGN has years of experience delivering these unique solutions, helping clients achieve high performance results. At CGN Global, we transform businesses globally, by delivering the unexpected. It is through years of service and outstanding transformative solutions provided, that we believe adopting a highly automated digital operating model can establish end-to-end processes, data connectivity and improved visibility, across the board.